Samantha Johnson was raised in Watkins Glen, New York, attending numerous dance schools, including Dance Experience, Glen Rhythm & Tumble, Filippetti’s Academy of Dance Arts, Leslie’s School of Dance and Ithaca Academy. She danced competitively and volunteered to assist beginner classes. She was involved with musical theater and choreographed several full musicals, while also performing in them, including taking the lead in Thoroughly Modern Millie. Sam also volunteered with the Lake Country Players, did competitive cheerleading for four years, and completed the arts track in school. Following graduation, she went on to pursue dance as a major at SUNY-Fredonia. While working towards her BFA in Dance, Samantha studied with Samantha Kenney, Angelika Summerton, and Helen Myers. She also attended MiraCosta College (Oceanside, California) for dance studies for three years, working under Dave Massey and Teresa Avina. Samantha has taught dance professionally with Fit Kids America Inc., Leslie’s School of Dance, and Ariel’s School of Dance. For Samantha, dance encompasses human history, culture, strength, expression, therapy, spirit, communication, passion, and skill. She would love to change the world positively through dance, and approaches it that way herself every day, with every class she teaches. Caryn Christianson has a bachelor of music education degree from Syracuse University with a major in percussion and minor in piano. After graduating from college, Caryn went on to graduate work at Carnegie-Melon University and Ithaca College. She has studied with such renowned artists as Gordon Stout, John Soroka, Leigh Howard Stevens, Ernest Muzquiz and Michael Bull on percussion, and Tadeus Kerner on piano. In addition to her work at TCFA, she is on the faculty of the Community School of Music and Arts (CSMA) and a volunteer at the Salvation Army. She has performed at CSMA, the Foundation of Light, the Ithaca Festival, the Apple Harvest Festival, Greenstar Coop, the Cornell museum, and numerous other venues. Caryn has taught music since 1985, using traditional teaching methods combined with an emphasis on theory to give her students a solid foundation for many different playing styles, including classical, jazz, rock, and Latin. Some of her students’ accomplishments include playing drums in a Coca-Cola commercial; graduating from Eastman School of Music; scoring 95 and above on NYSSMA Level 6 snare drum solos; and scoring 100 or 28 on marimba solos. William Gregg began playing piano when he was five years old. He went on to study organ, accordion, guitar, violin/fiddle, mandolin, banjo, Appalachian dulcimer, ukulele and autoharp. He also performs traditional American folk music. Bill regularly presents workshops at festivals such as the New England Folk Festival (NEFFA) and the Cranberry Dulcimer & Autoharp Gathering. He received the annual Leonard Reid Award for 2012 at the Mountain Laurel Autoharp Gathering in Newport, PA. In recent years he has taught several public group classes focusing on acoustic blues guitar. Bill started composing for classical guitar in the early 1980’s when he first taught at TCFA. Since then he has continued to write for classical guitar including 24 studies in all major and minor keys as well as many duets and trios for guitar and other instruments. In the mid 1980s, he began composing for digital synthesizers, alone and in combination with acoustic instruments. In 1989, he appeared on a compilation CD, Visionaries: Selected New Music, Volume II. In 1990 he presented an electronic “symphony” at Cornell University and issued a solo album of electronic compositions, Voyage of the Heart. He has released three more CD’s of electro-acoustic music that have received worldwide airplay. He is now concentrating on writing and performing finger style guitar works, many in alternate tunings. 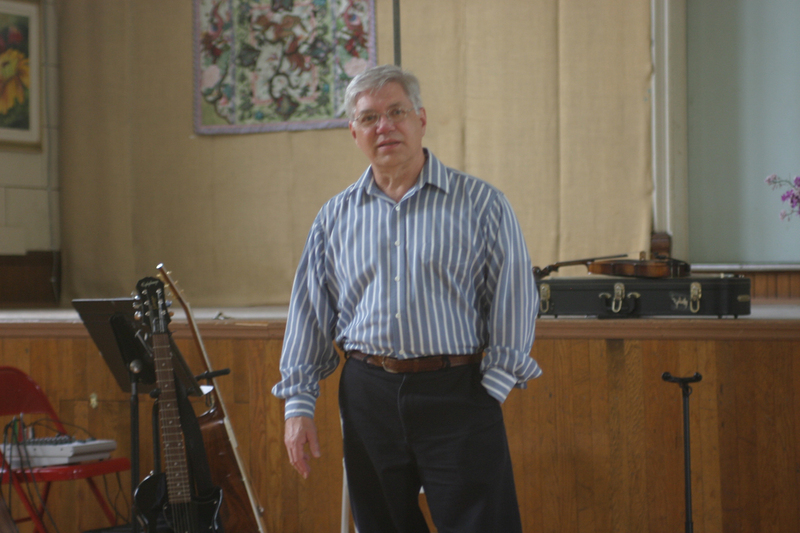 Bill returned to the faculty at TCFA in 2003 and continues to enjoy teaching stringed instruments to young and old. Shelby Dems, from North Syracuse, has been playing violin for 15 years, and just started her master’s degree program at Ithaca College as a Suzuki Pedagogy/Violin Performance major and graduate violin studio teaching assistant in Fall 2016. She made her second solo appearance as the winner of the Syracuse University Symphony Orchestra Concerto Competition in April 2015, playing the first movement from Haydn’s C Major Concerto. Shelby also made her debut as a solo violinist at this event, winning the SUSO Concerto Competition in 2013, playing the first movement from Mozart’s 5th Concerto. She has also played as a soloist with Cazenovia Counterpoint, and Masterful Musicians LLC. Shelby has performed in a variety of ensembles and concerts—with Mark Doyle at the Syracuse Jazz Festival and Guitar Noir Concerts; with the Syracuse University Symphony Orchestra; with Chamber ensembles, Baroque ensembles, and at the Syracuse Summer Festival, as well as with the Strasbourg Conservatory Orchestra in Strasbourg, France where she studied in 2012. She has been the recipient of the Marion Armstrong Award and Irene L. Crooker Music Award in 2014, as well as the Civic Morning Musicals Performance Award in 2013, and was a finalist in the Syracuse Symphony Orchestra Concerto Competition in 2010. She has had her own private studio for the last six years and has been working at Music and Arts, teaching violin and viola for the last three years. Shelby has studied with teachers including Jim Krehbiel, Peter Rovit, Haik Davtian, Harumi Rhodes, and is now studying with Calvin Wiersma at Ithaca College. Elizabeth Dawson is a sophomore at Trumansburg High School. She has studied piano for nine years and achieved high scores in performances at NYSSMA (New York State School Music Association) events, including 27/28 in both 2013 and 2014 at Levels 3 and 4; a 96/100 on a level 5 in 2015, a 98/100 on a level 6 in 2016 and most recently a 99/100 on a level 6 in 2017. She is also a percussionist in the high school concert band, and plays piano in the Jazz band, and is the accompanist for the Trumansburg school choirs. Elizabeth loves sharing her passion for music with others! Born in Ithaca NY, trained in jazz in Philadelphia, PA and schooled in sacred/secular music in her ancestral homeland of Cuba, vocalist Venissa Santí traveled a long road to develop her signature musical style. She is a 2008 PEW Fellow, signed to Sunnyside Records. Venissa has taught voice lessons since 2001 and works with beginners, intermediate and professional singers to develop their sound and explore diverse and exciting repertoire and vocal technique.